Crow Canyon Software hosts regular webinars around leading topics in the Microsoft environment. Sign up for our Upcoming Webinars or watch our recently completed On Demand Webinars. 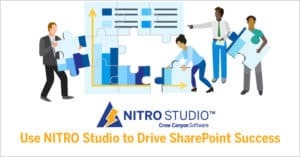 Crow Canyon Software’s NITRO Studio offers powerful capabilities for automating and streamlining business processes using Office 365 and SharePoint. NITRO Workflows and Custom Actions, two important components of NITRO Studio, allow the creation of numerous workflows, whether simple or complex. At the same time, Microsoft offers Flow as a workflow tool. Are NITRO and Flow compatible? How do they interact? 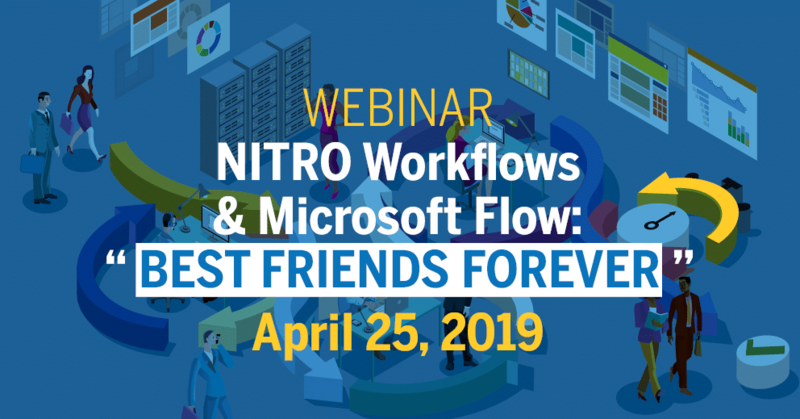 Find out how NITRO Studio and Microsoft Flow have become BFF’s! Crow Canyon has partnered with Agilis, Inc. to provide an integrated EOC Rounds / Work Order System solution that meets the requirements for compliance with the Joint Commission EOC (Environment of Care) standards. 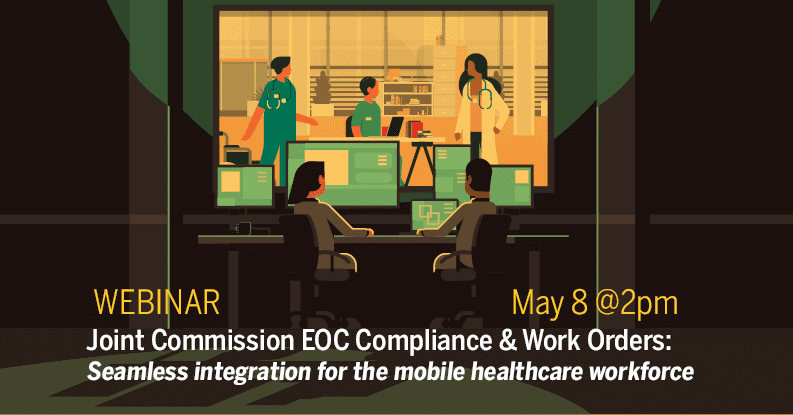 In this exclusive webinar, learn how hospital personnel in facilities, security, fire safety, infection control, hazardous waste, safety and utility management can now automatically identify, capture, track, and manage work orders identified from EOC rounds. 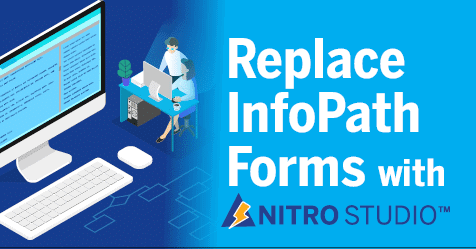 See how you can easily automate business processes and replace legacy form solutions such as InfoPath with NITRO Studio with forms, workflows, portals, reporting, and much more in NITRO Studio. Apps, Forms, Workflows and Tools of Office 365: What to Use When? Building business applications has never been easier, but knowing where to start, how best to use the tools, and understanding the limits can be confusing. 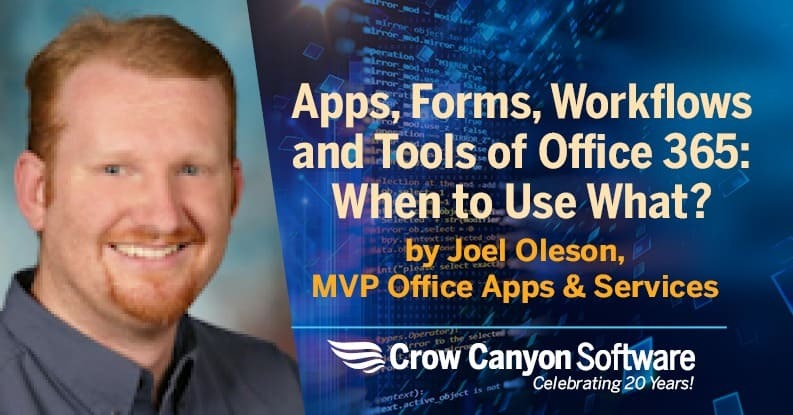 Learn from MVP, Joel Oleson and Crow Canyon Software’s Scott Restivo. 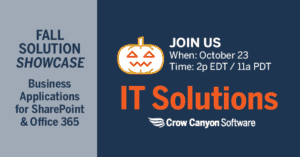 Find out what Crow Canyon’s NITRO Studio can do to move your business forward by ending reliance on outdated solutions, such as InfoPath. See how easy it is to build attractive, highly functional, mobile-friendly forms along with workflows and actions that automate business processes. In this on demand session, MVP Matthew J. Bailey shares his real-world knowledge about the top “must do” items in Microsoft Teams, how to understand it and use it best at this time. Lost emails? Missing approvals? Delayed purchases? No more! With Crow Canyon’s SharePoint and Office 365 Purchase Order System, you can track your purchases from thought to fulfillment. 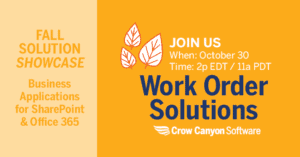 Crow Canyon’s NITRO Studio brings you the tools to engage users, streamline operations, and drive continuous improvement. NITRO runs in SharePoint on-premises and in Office 365. NITRO Studio’s Portal has an easy-to-navigate, secure interface to engage with any application you build. With the “Modern UI” in SharePoint, we are able to take advantage of advanced mobile capabilities this brings. 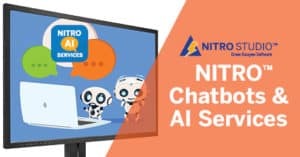 NITRO Studio brings Artificial Intelligence (AI) to SharePoint. How about searching a Knowledge Base using natural language? Or getting IT support any time of day by interacting with a chatbot? Learn how Crow Canyon does just that in SharePoint. See how easy it is to build attractive, highly functional, mobile-friendly forms along with workflows and actions that automate business processes. Replace InfoPath, Lotus Notes, Access, SharePoint Designer, and more. See how SharePoint, whether in Office 365 or on-premises, can provide robust solutions that meet core business needs. Our user-friendly, SharePoint-based applications streamline operations, improve efficiency, and turn SharePoint into a productivity powerhouse! See how SharePoint can meet IT needs. We showcase our IT Help Desk, Asset Management, Contract Management., Employee Portal, Onboarding, and more. Managing work orders and equipment efficiently is important! We present our Facilities Request system, Work Order tracking, Equipment Mgmt, Contract Mgmt, Onboarding, and more. SharePoint can meet critical HR needs and help manage employee relations. This webinar will show you how, with our HR Request system, Document Management, Task Tracking, Portal, Onboarding, and more.